← Are you passionate about your job? The Dragonfly Effect is a book by Jennifer Aaker and Andy Smith about ways to use social media to drive social change. 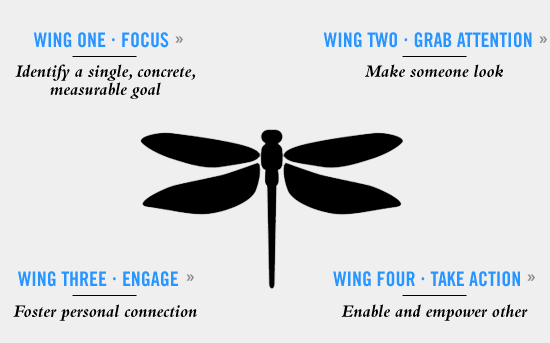 They use the analogy of the wings of a dragonfly as the four essential ingredients in any social media campaign. It breaks down how to ‘do’ social media to drive change into four ‘wings’. Wing one; is about focusing focus on a single concrete measurable goal or outcome and then breaking it down into small manageable actions or chunks. Wing two; is how to grab attention and get noticed amongst all the other noise that we are all bombarded with. Wing three; is about engaging your audience emotionally through telling stories and making a personal connection. Wing four; is about how to make it easy for your audience to take action and enable others and the importance of providing fast feedback. So my advice is, if you are planning to use social media (or drive any sort of change) to take these principles and get on with testing out your campaigns and messages rather than spending time reading the book. I’d love to hear about what you are doing and what is working and not working for you on social media right now…. This entry was posted in book review, insight, social media, Uncategorized and tagged change, charity, connectedness, fundraising, The Dragonfly Effect. Bookmark the permalink.